Not a whole lot to report on my end, which is why I haven't updated in a while. I've started major preparation for my powerlifting meet coming up in March - I'm doing the FULL meet this time (rather than just one lift), so I've got a lot more work to do. But this time, we've got a crew! There are three of us who are actually competing, plus a few more people who just want to follow the powerlifting program rather than the regular gym programming, so it's nice to have people to commiserate with, because truly, these last two weeks have been really difficult for me. 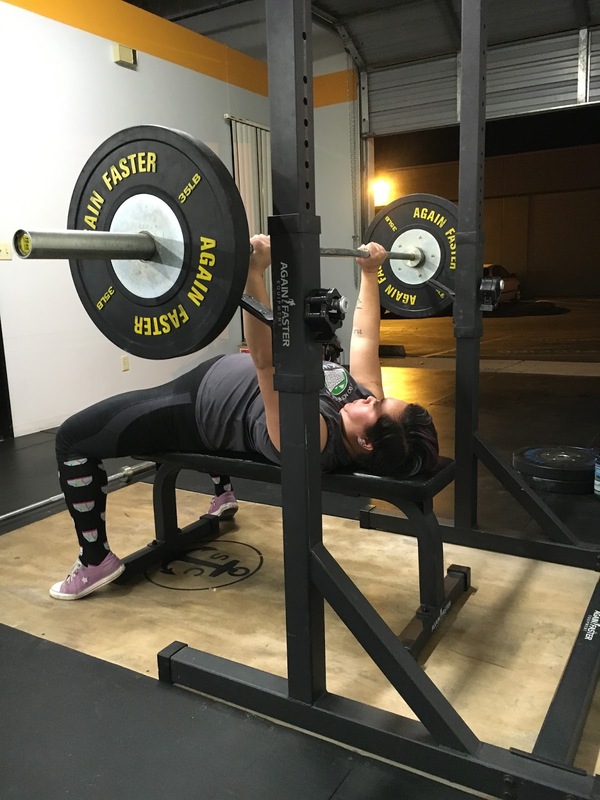 For this initial part of the program, we're lifting at high volume, and for me, it's especially grueling because I set new 1 rep max PRs right before I took time off for the holidays/being sick, so coming back after a few weeks off with brand new percentages (which translates to heavier weights) means that everything is harder than I'm used to, and I have to hit those numbers for more reps than I'm used to. It doesn't matter if people compliment me on my strength, because right now, everything feels hard, and I feel weak. And I'm not saying that out of self-pity; it's the simple truth - it doesn't matter how strong I am or how strong you are, because if you want to improve, you have to keep pushing your limits and going heavier, heavy for you. It doesn't matter how strong I am, because the percentages I'm working at leave me feeling drained and sore every single time. In the meantime, I'm also training for the runDisney Pixie Dust Challenge in May. This training is difficult for a different reason: after all the running I've done in recent years, this should be no problem, except that I'm coming back from an injury, so my endurance is shot to hell, and I have to be really careful with my knee. I need to run more so that I can build up my endurance, but I can't run too much or too hard, lest I aggravate/inflame my knee. Maybe this is a fool's errand, but I'm determined to complete these two races, determined to recapture even a fraction of my former accomplishments and abilities. But I also know that there's that part of me that will never be happy unless I put up a good time for my runs, even though I'm clearly nowhere near PR shape. I'm in a total struggle with my limitations right now. With lifting, it's a struggle for me to keep pushing my limits out further and further, and with running, it's a struggle for me to respect my limits. With lifting, it's a struggle for me to keep trying and to keep believing that I'm capable of so much more, and with running it's a struggle for me to deal with my current ability level, knowing that I have been capable of so much more in the past. So yeah, it's been a frustrating couple of weeks, to say the least.Especially this last week, as we really hit the ground running with this program - I've been tired and sore every day, and I also haven't been able to run in a full week because my knee has been stiff (not hurty, just stiff). So I'm not even doing all the workouts I should, because I had to skip my runs this week, and if I'm THIS tired now, how are things going to be when I have to add my running back in too? I've been having a lot of "What even is the point...?" moments, but I know that, bottom line, I will keep at it. Because the point, of course, is that deep down inside, I actually really love all this, and the main limitations I'm struggling with anyway are not the physical ones, but the mental ones.